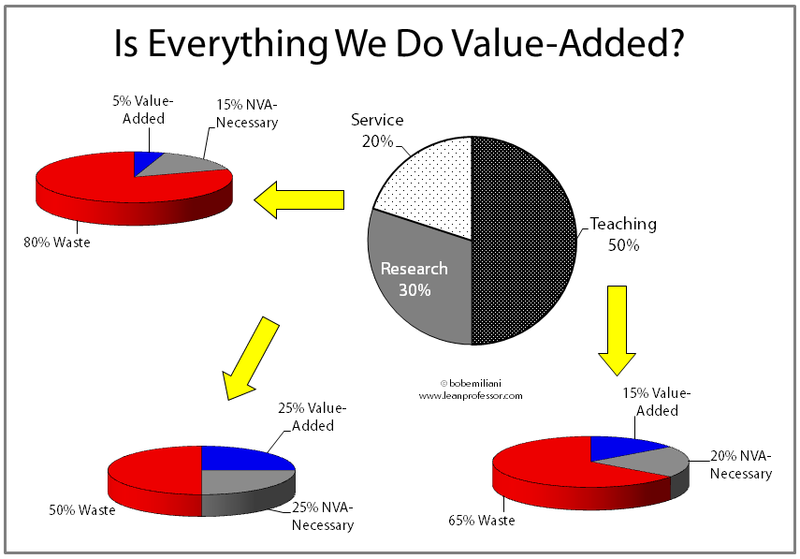 Is Everything We Do Value-Added? We also have to contend with unevenness and unreasonableness, just as everyone else does. People who do not think of their work in terms of processes believe that all of their work is value-added. Can everything we do be value-added? The answer, of course, is “No.” In formal Lean terms or otherwise, we recognize work that is waste in teaching, research, and service. We have all experienced problems in teaching that has resulted in re-work. We have all done research that went nowhere. And we have all spent time in meetings that were unproductive. Several times a day, we should ask ourselves the question: “Is what I am doing at this moment value-added, non-value-added but necessary, or waste?” For teaching, we should ask this question from the students’ and payers’ perspective. For research, we should ask this question from the payers’ perspective (or from their source of funding). And for service we should ask this question from an institutional perspective (or from the perspective of the profession). Acknowledging the reality that work is made up of these three components opens the door to new opportunities.